You can turn a standard picture into a piece of art with the help of our graphic design team. They're clever, they're creative and this is the work they would love to do for you. A picture, they say, is worth a thousand words, but how often do you see a picture that actually adds to a web page? One that han't simply been put there to simply fill up white space? We add pictures to a web page to for appearance purposes and to break the boring monotony of just having word after word but most often it's just a plain picture. If you can change that plain picture into one that could make you a sale then why not do that? Did you know it's fairly easy to dress up a drab website by simply changing a few pictures into display-type advertisements covering some of the products and services you offer? 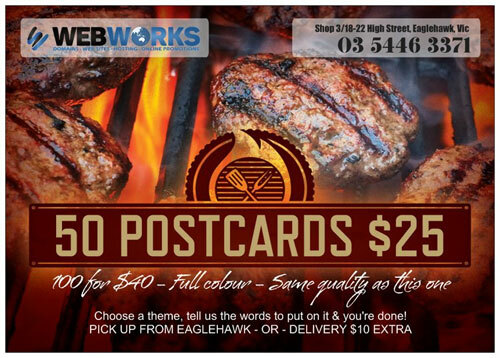 We charge $60 per hour plus GST for graphic design work on a pro-rata basis. The cost of upgrading your pictures does range in price depending on what is required. As a rough guide, an image like the sizzling deal we put on the right of this page would be a once-off cost of around $35-40. The beauty of this kind of work is that we can do this for you over a period of time. Set yourself a budget, say one or two pics a week and you'll have a great looking web site in no time.